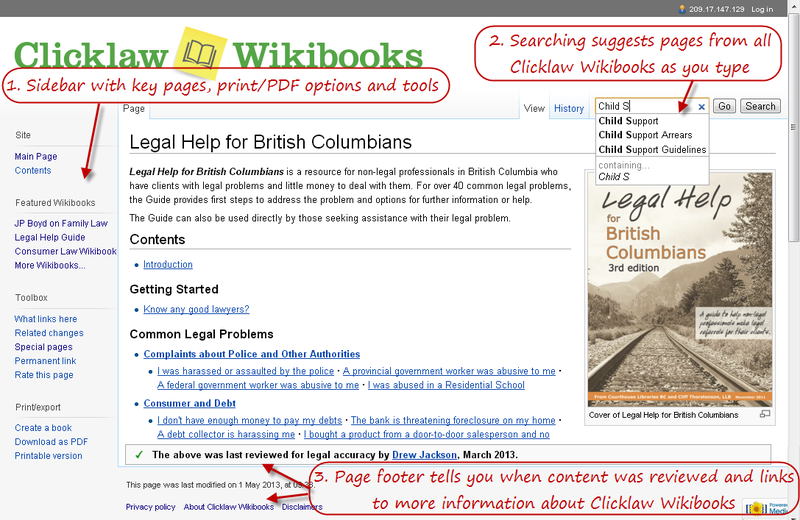 The sidebar gives you access to important pages and commands on Clicklaw Wikibooks. For example, there is a link to the main page of the site, shortcuts to specific Wikibook titles, and printing options. The tabs on the top of each page enable visitors to see previous versions of the page and enable contributors to make edits and discuss the page. The search box on the top right of each page enables a full text search over all Clicklaw Wikibooks. The table of contents block towards the top right of every page, which provides links to main sections of a Wikibook. The navigation box (called a "navbox") at the bottom of every page, which provides links to all pages of a Wikibook; the navbox is like a sitemap for a specific Wikibook title. This page was last edited on 29 March 2013, at 14:03.